Indiana Amtrak Service Saved. Now, How Can It Be Improved? Rail riders and advocates in Indiana won a big one this week, securing the additional state funding needed to keep Amtrak’s Hoosier State line operating four days a week between Indianapolis and Chicago. It was the last, and most hotly contested, of the 19 agreements Amtrak was required to negotiate with 15 states in order to maintain service on its “state-supported” routes. So the good news is, no vital service to small towns or big cities was eliminated, even where it seemed most vulnerable: Indiana lawmakers had originally balked at the $3.1 million annual expense. The rhetoric goes that it is much easier to improve a service than it is to resurrect a dead one. Crisis averted. So now what? The service is still crummy at best with scheduled departure times from Indy (to Chicago) at 6 a.m., four times a week and comparative arrival times in Indy (from Chicago) of 11:50 p.m. Furthermore, the duration of the trip is a scheduled 5 hours+. Most would agree that these timetables do not represent an optimum way of traveling to and from Chicago, especially when Megabus offers a comparatively quicker travel time, several departure options a day and is cheaper. Automobile travel is competitive as well, although, when calculating gasoline and parking, the economics become murky. Even still, a car trip to an outer Metra station and $1.50 charge for parking for the day represent a great value and, if timed properly, still quicker than Amtrak. Is there a way to improve time tables to make the Hoosier State more desirable? Travel time aside, if the train left at say 8 a.m., would the Hoosier State become more marketable? Amtrak still has a value proposition in that it IS a train (and who doesn’t like riding the train?) and it offers the opportunity to let loose the wheel and get work done while Amtrak does the traveling. 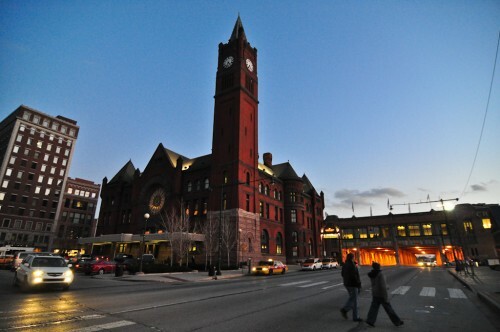 Further, there are no parking costs associated with taking the train and a later departure time from Indy would insure that using IndyGo to get to Union Station is a possible option for arriving downtown. What about increased frequency? Perhaps a midday departure as well? Elsewhere on the Network today: The Dallas Morning News’ Transportation Blog gets into detail on the widening chasm between TxDOT’s big spending and its revenues. Better Institutions questions the claim that cul-de-sacs are the best way to accomplish “social cohesion.” And Biking Toronto reports that Canadian authorities have shot down the Ontario Coroner’s recommendation that sideguards on trucks should be mandatory to prevent pedestrian and cyclist fatalities.